Booking a ferry to Greece and the Greek Islands couldn't be easier with AFerry. You can either use the booking form at the top left of the page. Greece is a popular tourist destination that boasts beautiful beaches, picturesque traditional villages, stunning landscapes and numerous sites of historical and archaeological interest. Visit the Acropolis of Athens, the Minoan Palace of Knossos in Crete or the ancient monasteries of Meteora. Experience true cosmopolitan life in Athens or Thessaloniki, or explore the forests and coastal walks of one of the many Greek islands. There are more beautiful and historic sites in Greece than it is possible to list. Special mention should of course be given to the Parthenon, the largest temple in Athens which is known the world over for its columns. Entry to here, and many other historic sites in Greece, is free to students of EU universities. The country of Greece has captured the imagination for at least 2000 years. 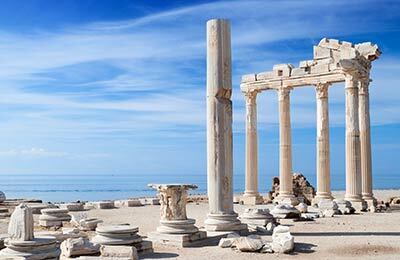 It is famous for its culture of classical antiquity as well as a delicious selection of food and a bountiful diversity of landscapes. In many ways, ancient Greece represented the birth of Western civilisation as we know it, leaving behind a legacy of democracy, language, philosophy, science and culture. Modern day Greece is just as vibrant. You can travel in Greece either by car or public transport. Whilst the car offers a level of flexibility not found in public transport, for example when travelling to remote destinations, you might be deterred by the high accident rate and the crazy nature of Greek driving in the cities. The road network in Greece is well developed and a great way to see the country. This quality does often result in toll roads, so it is always a good idea to carry some spare change with you. Intercity buses are another popular method of travel. The buses are comfortable and government subsidised, resulting in a myriad of routes and cheap tickets. Rail travel is a bit more hit and miss. It is only in the last ten years or so that Greece has rediscovered the value of rail travel and so far there are few areas of the country that have benefitted from the heavy investment made. The buses are comfortable and government subsidised, resulting in a myriad of routes and cheap tickets. Ferries are, of course, a good way to travel around the different islands of Greece and AFerry is a great place to buy these ferry tickets. There are more beautiful and historic sites in Greece than it is possible to list or even to count, especially round the big cities. Special mention should of course be given to the Parthenon, the largest temple in Athens which is known the world over for its columns. Entry to here, and many other historic sites in Greece, is free to students of EU universities. Greece combines buildings with lush vegetation. Greece is one of the safest places of to go on holiday, and there are wide range of restaurants, bars and clubs in most cities. Greek food is an exotic mix of the best of the East and the West of the Mediterranean and there is no other experience like it in the world. Greece is one of the safest places to go on holiday! You should be wary of taking photos of statues and monuments when other people are standing in front of them when in Greece - this is considered to be a rude. Always avoid taking photos of airports and military installations. Greek authorities take this very seriously. AFerry offers the best way to find the cheapest ferry routes to Greece with its easy to use booking form. 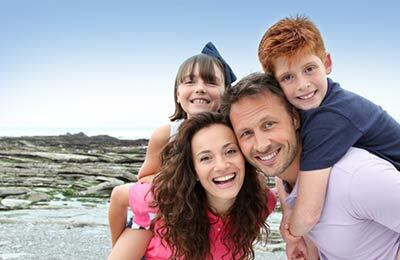 Begin your holiday on a ferry and start relaxing straight away! 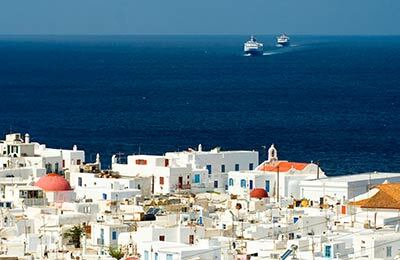 For a complete guide to Greece, the Greek island and taking a ferry in Greece, please read AFerry's Guide to Greece and the Greek Islands.